When you think of dandelions do you think of invasive weeds or tasty treats? Believe it or not, dandelion is used in a variety of foods and drinks and provides many health advantages. For instance, one of the most notable benefits of dandelion tea is its ability to act as a natural diuretic. Dandelion herb is used in a variety of culinary tasks, and you can even try your hand at some at home wine making with a delicious dandelion wine recipe. One of the most amazing things about this often shunned yard dweller is how incredibly versatile it is. Even dandelion root is used in many applications. If you’re still not convinced that dandelion recipes are worth giving a shot, then maybe you will be after your taste buds are tantalized by reading our four fabulous dandelion recipes below! 1. 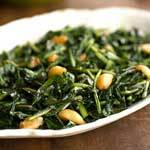 Southern dandelion greens: Sautéed preparations are popular fare amongst dandelion recipes and this gem of a preparation method enhances the flavor of these healthful plants. If you’re looking to take advantage of dandelion health benefits like appetite stimulation, this recipe is for you. Clean and cut dandelion leaves into 2 inch sections and cook in salted water until tender or about 10 minutes. In another pan, sauté ½ cup chopped onion, a clove of garlic chopped and one whole chili pepper crushed with the seeds removed in oil. Drain the greens and add the fixings that you prepared in oil. Season with salt to taste and top with parmesan cheese if desired. 2. Dandelion Salad: Roughly tear ½ pound of dandelion greens and add chopped tomato and red onion as freely as desired. Add salt and pepper to taste, along with ½ teaspoon of dried basil to add a touch of sweetness. 3. Revised Dandelion Salad: If you’re looking to spice up salad dandelion recipes, you may want to try this savory side. Combine equal parts dandelion greens and spinach. Add in goat cheese, diced pears and walnuts. Top with a homemade red wine and vinegar dressing for a delicious first course, or as a tasty home remedy for muscle cramps! 4. Italian Style Greens: Vigorously wash dandelion greens and heat your choice of fat in a skillet. Plain oil is fine, but lard or goose fat are equally sufficient. Sauté the greens in your hot fat until they are the tenderness you desire. Add chopped garlic and remove from heat and drain. Salt the tender greens to taste and enjoy!